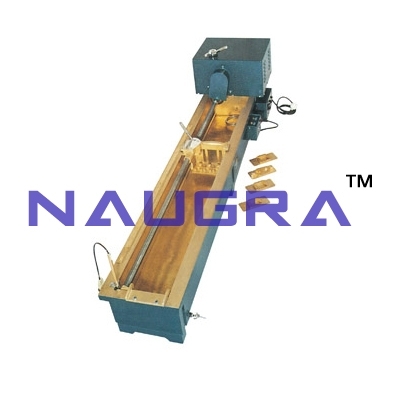 Ductility Testing Apparatus for Bitumen Testing - Designed to test three specimens simultaneously. The machine consists of a carriage moving over a lead screw. An electric motor driven reduction gear unit ensures smooth constant speed and continuous operation. The entire assembly is mounted with a stainless steel lined water bath completely encased in metal bound hardwood. It is equipped with an electric pump circulator and heater. The temperature is controlled thermostatically. Two rates of travel i.e. 5 cm/min and 1 cm/min are provided. Suitable for operation on 230 V, 50 Hz, Single Phase, A.C. supply. COMPLETE WITH: Ductility Mould , with Base Plate 3 Nos. Thermometer IP 38 C, Range: 23o C to 27o C.
We are leading manufacturers, suppliers & exporters of Ductility Testing Apparatus For Testing Lab for Bitumen Testing Lab. Contact us to get high quality designed Ductility Testing Apparatus For Testing Lab for Bitumen Testing Lab for schools, colleges, universities, research labs, laboratories and various industries. We accept bulk orders for government tenders in all countries around the globe.